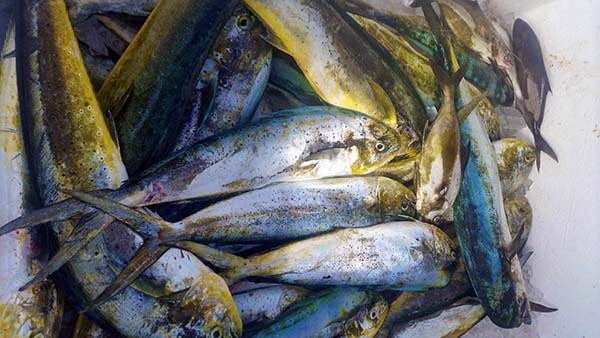 The Dolphinfish fishing in Miami has been strong with great catches still coming in on our all day trips. This time of year the fish are out past 900 feet of water. About a 5 mile ride off shore before we start looking for fish. This time of year the schools of fish are wide spread so all day trips are needed to be successful. We find the majority of the Summer Mahi Dolphin Fishing Miami under birds. The Man-O-War or frigate Bird is one of the best indicators that Summer Mahi Dolphin Fish are on the surface feeding. Seagulls and Turns also help us locate schools of fish. 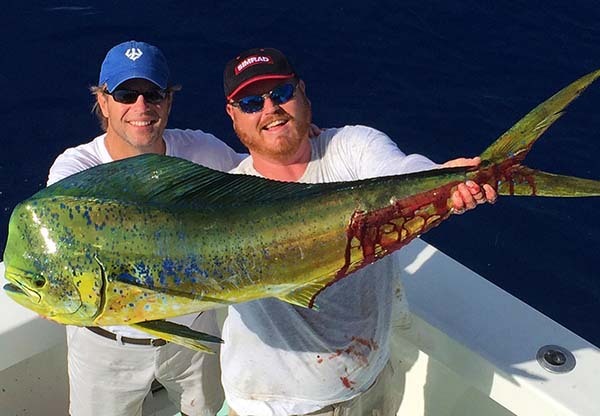 We also find great Summer Mahi Dolphin Fishing Miami under any floating debris of large mats of sargasso weed. Any large “Floater” can be a goldmine of fish this time of year. The Floaters will home to schools of bait fish. Such as assorted jacks, sardines, and small pelagic fish like file fish and trigger fish. All the favorite forage fish to Dolphin Fish. Trolling rigged Ballyhoo and small feathers are the best baits to pull over long stretches of water trying to locate Mahi Mahi Dolphin fish. Once we locate fish we switch tactics to casting small live baits, cut bait or jigs to catch Summer Mahi Dolphin Fish. My favorite little secret id to “Make Bait” or catch live bait out in the fishing grounds. We will stop on the first large floater or weed patch we find and chum the water and use Sabiki rigs to catch bait. Small Blue Runners are my favorite, but all the small bait fish that you find out there works well. 20 pound spin tackle with short 50 pound leaders and a 5/0 to 7/0 hook work well. I like larger hooks with a longer shank best. It helps keep the smaller school fish off the hook and makes de-hooking caught fish easier.